The same popular 9004 skimmer is now available with an efficient DC pump! 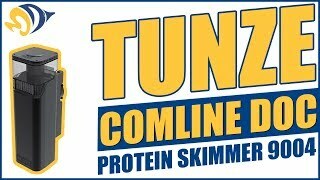 The new Tunze Comline® filters opens the way for compact aquarium components designed for internal operation, are ultra-functional and are highly-sophisticated. The system creates a natural atmosphere in the aquarium at a minimum size. The goal always remains the same, more performance and less space. Attachment with a patented magnet holder for a glass thickness of up to 1/2". Intermediate chamber with patented anti-overfoaming system. I have mine set up and running on a IM Fusion 40 tank and it's working great. Like others note, it does skim a little wet but awesome overall. Difficult to assemble/disassemble for cleaning and maintenance. Not too bad to adjust. Skims a little wet but does a great job. Very Happy with this one. Great Product very controllable works and produces a great skim mate almost out of the box !